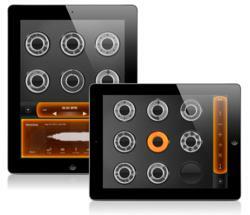 A Tasty Pixel’s popular live-looping iPad music app Loopy HD is 50% off for the Easter period. Loopy HD was recently awarded second place in the 2011 Best App Ever Awards for Best Musicians App, receiving more votes than Apple’s GarageBand app. Loopy HD lets users create music by progressively layering loops of recorded sound, on a sleek and tactile interface. [Loopy HD] is the rare app that's recommended for both aspiring music makers and accomplished soundscape programmers alike. Software artisan company A Tasty Pixel today announces that its widely-praised live-looping app, Loopy HD, will be on sale for the duration of the holiday period, at 50% off the usual price. The app allows anyone to create music by layering looped recordings of singing, beatboxing, or playing an instrument on a sleek, tactile interface that combines power with simplicity. Quebec-based Jazz, R&B and Soul musician Malika Tirolien recently released a performance on YouTube heavily featuring Loopy HD. Device Requirements: Loopy HD requires an iPad, iPhone 3Gs or newer, or 3rd-generation iPod Touch or newer (microphone accessory recommended) running iOS 4.0 or later. Pricing and Availability: Loopy, the iPhone-only version of the live looper app, is available for $2.99 exclusively through the App Store in the Music category. Loopy HD, the iPad (Universal) version of the app, is 50% off for the Easter period, available for $3.99 through the App Store (normally $7.99). A Tasty Pixel specializes in apps with beautiful and functional user interfaces – software that works like an extension of oneself, with the charm and elegance that make it a pleasure to use. A Tasty Pixel currently has two iOS apps available on the App Store -- The Cartographer and Loopy. A Tasty Pixel products have been extensively featured by Apple and have been awarded on several occasions by the prominent iOS industry awards, Best App Ever Awards, hosted by 148 Apps.